Sunday, June 9, 2013 at 7:30a.m. Male candidates must wear either boxer, brief or board shorts when qualifying – no jammers. Female candidates must wear a standard one piece or two piece bathing suit. Applicant must finish swim in 75 seconds or less to continue. 25 yard swim; 25 yard applicant carries manikin in cross-chest position in 70 seconds or less. 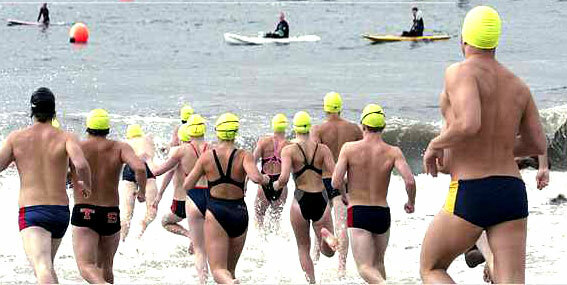 Applicant must complete the approximately 350-400 yard swim on prescribed open water, run-swim-run course to continue. Stopping will result in being disqualified. Note: All elements must be successfully completed to be considered qualified for hiring (Not necessarily performed in this order). All candidates must provide their own transportation between SCCC and Jones Beach West Bathhouse. Candidates must be at least 17 years of age by the date of the test - no exceptions. Candidates must be able to successfully complete both the Lifeguard Qualifying Procedure and the lifeguard training program. All candidates must attend 40 hours of required training in pay status before they can be considered for placement as New Hire lifeguards. Basic First Aid and CPR for the Professional Rescuer/AED with Administering Oxygen certification will be provided during training. No prior swimming certifications are necessary. All candidates participating in the Qualifying Procedure must present photo proof of age and identity prior to the swim. Please have valid government photo identification. Candidates must have at least 20/40 uncorrected vision in each eye. Contact lenses or glasses are not permitted. Immediately after successfully completing the procedure, Park assignments will be made in the West Bathhouse Pool meeting room. An original birth certificate indicating that the candidate is at least 17 years of age (current U.S. Passport may be presented in lieu of birth certificate at the time of hiring). Candidates who are 17 years of age must present valid working papers. All New Hire candidates must present acceptable proof of employment eligibility. All New Hire candidates must successfully complete 40 hours of lifeguard rookie training in pay status and achieve certification in Basic First Aid, CPR/AED (Professional Level) and Administering Emergency Oxygen prior to reporting to their assigned work stations. Please note that candidates will have approximately one week to submit all required documentation and may need to make an appointment with their physician. The Lifeguard Qualifying Procedure will be held at the Health, Sports and Education Center. I do think that increased heels will arrive to turn into a great offer more jointly having a great offer more favored belonging to the future, specifically in Christian Louboutin shoes outlet. individuals of a each and every alter in taste. this can be certainly a attractive Christian Louboutin Slippers. So in circumstance it's good to get a attractive girl. Louboutin in order to meet you, make you an incredible offer more beautiful. Welcome to our UGG Online Store! Here we have a wide variety of ugg boots outlet for you to choose from. Quality UGG should be lightweight and flexible to make every step a pleasure. Fashion snow boots will make you more noticeable. Enjoy your shopping in our UGG Boots Clearance!